This is my review of the new Holiday Inn Express London Heathrow Terminal 4 hotel. Or, to be more accurate, a quick overview. Yesterday I reviewed the new Crowne Plaza London Heathrow Terminal 4 hotel (click here), which is where I spent the night, but I got a tour of the Holiday Inn Express. Both hotels share the same building and, interestingly, share many of the same facilities. whilst the hotels have separate reception areas, they use the same bank of lifts and the hotels are not separated by floor. 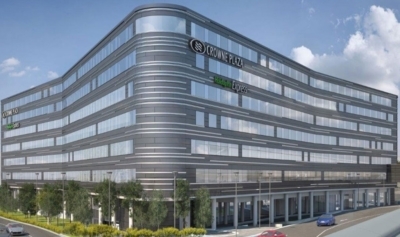 Each floor contains both Holiday Inn Express and Crowne Plaza rooms. The only area that is strictly out of bounds to Holiday Inn Express guests is the gym, which is only for Crowne Plaza residents. Even if you are looking for a ‘classy’ experience, I wouldn’t blame you if you decided to save £35 plus the cost of breakfast by staying in a Holiday Inn Express room. You can use the saving to have a few drinks in the smart shared bar or to put towards a good meal in the Urban restaurant. You can read more about the bar and restaurant in my Crowne Plaza Heathrow T4 review here. You should also read my Crowne Plaza T4 review if you want to know the options for getting to and from other Heathrow terminals. Back to the Holiday Inn Express Heathrow T4 …..
Access to the hotel is via the gangway from the Departures level of Terminal 4. The same gangway also leads to the Hilton Terminal 4 (reviewed here) and the Premier Inn (review), but the new Holiday Inn Express is the nearest. The only major difference to the Crowne Plaza rooms is the lack of a formal desk. You get a kettle with tea and coffee, as you do in the entry-level Crowne Plaza rooms – you only get a Nespresso machine in a ‘business’ room at the CP. Heading into the bathroom, everything is spick and span. There is less room around the edges of the sink than in the Crowne Plaza but that isn’t a major niggle. Toiletries are from dispensers in standard Holiday Inn Express style. The shower is also perfectly acceptable – it is a sign of how good ‘budget’ hotels are these days that the facilities are better than many of us have in our own homes. 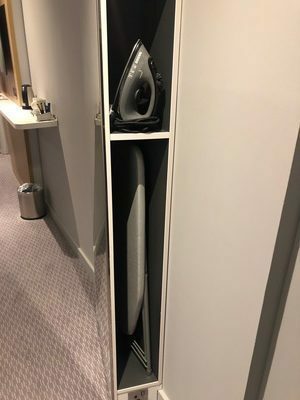 This ‘hidden’ iron and ironing board is also a useful touch – the mirror is on the other side. This is the ‘Holiday Inn Express side’ of the lobby, although guests at either hotel can wander around all of the facilities without issues. This is the bar which also serves food. I can imagine that some Crowne Plaza guests looking for a less formal meal than offered at Urban will end up here. This is looking off to the side – the free Holiday Inn Express breakfast buffet is served down here. It was late afternoon when I took these pictures so I didn’t photograph the food. I though this newspaper spread was a nice touch, especially for solo travellers – although perhaps they over-ordered China Daily ….. I was very impressed by the Holiday Inn Express London Heathrow Terminal 4, as indeed I have been by all of the recent HIE hotels I have seen which use the new ‘Generation 4’ design scheme. The co-location with the Crowne Plaza offers the best of both worlds here, with high quality but low(er) cost rooms and the ability to use the more upmarket CP bar, restaurant and lobby cafe if you want to eat or drink well. For cash, rooms are typically £75 midweek (free breakfast included) at the moment, compared to £110 (room only) at the Crowne Plaza. Redemptions are 20,000 IHG Rewards Club points per night compared with 30,000 points at the CP. The next Heathrow openings which are directly connected to the terminals will be the Hilton Garden Inn Terminal 2/3 – which has the same ownership as this hotel, Arora Group – and, unless the project has now been scrapped as is rumoured, the Aerotel inside Terminal 3. The Holiday Inn Express Heathrow Terminal 4 website is here if you want to find out more or to book. The Crowne Plaza website is here for comparison. Do we have any idea when the new Hilton Garden Inn will be opening up reservations? (I know it opens in February, but I’m hoping to book a night with my HHonors points sometime soon.) Grear review – the Holiday Inn Express looks to be one of the nicest I’ve seen! Too many EE whores in the airport hotels. None at the CP, clearly missed out there! Can’t say I’ve ever noticed. Though, would imagine they’re busy with, ahem, bookings if they’re there. Am I slow here but what is ‘EE’? I think I should be safe from that. I can’t understand why anyone would consider paying twice as much as Premier Inn for a similar standard hotel. But the Sofitel at LGW is an atrocious example of the brand. Why on earth they dont rebrand it goodness only knows. Its simply awful imho. Also owned by arora. Strange they can be so good at Heathrow and so bad at Gatwick. LGW hotel started life as a Meridien … changed in 2004 when Arora bought it and got a 15 year franchise for the Sofitel brand. Wonder will we see any changes next year ? At least they revamped the suites in the last 12 months. Gatwick is very much an LCC / charter airport and geared more to that market. LHR is geared more to flag carriers and the business market – its also the home of the national flag carrier. Those flying out of Gatwick are often doing so because there is very little or no choice for the destination – they are also less likely to be paying top $$$ for their travel. In other words, at LHR they need to try more than they do at LGW – at least for the moment – once they become established at LHR, lets see just how shiny shiny things are kept. Except it won’t be. 12th December, picked at random – £65.50 PI room only, £72 HIX with free breakfast and IHG points and better facilities due to access to the CP bar, cafe, restaurant. But surely the CP bar and restaurant are open to anyone anyway? Obviously, but not the same as having it 30 seconds from your room vs a 5-minute walk. Nah … no-one ever leaves their own hotel to take a walk to a totally different hotel just to have a beer in a bar that is nicer than the one in their own property! Depending on how your Accelerate offers fall, an extra night in a HIX (or whatever abbreviation we’re using now) could get you a free night at an Intercon! Agreed, had a flexible booking at the Premier Inn for next year at £40, just checked HIX and it’s £85 on the same night so won’t be switching unless it will get me lots of points in an Accelerate promo. What is PI now for the same night? PI is £45 now, the booking is for October next year though, maybe PI price their rooms for bookings far in advance a lot cheaper. Rob – great review thanks. The Holiday Inn Express is now definitely on my list for Heathrow. Useful to see something better than the Premier Inn for not much more. Its almost becoming a race to mediocrity at LHR with all these low cost brands popping up. I recall when the Radisson Edwardian was 5* and was an excellent place to stay. However lack of high calibre management decisions and poor investment has let it slip to join its neighbours up and down the Bath Road. As I sit in our suite at the Sofitel T5 waiting to go for breakfast, I thank Accor for not letting standards slip here. I shall continue to give them my money and earn their points until they take their eye off the ball – and that doesnt look like happening any time soon! New chef in the Belle Epoque too….Mark Lawton ex of The Ritz and Ramsey’s Hospital Rd branch. Absolutely stunning food with the usual amazing wine list courtesy of J and B. No, i shant be using any of these new generics – how would you choose one? Perhaps the Marriott would be the best because you can take the parking pod to T5…….and that’s quite fun! OT has anyone else experienced the delights of a beer outside the Green Man pub at Hatton Cross in the Summer? You can almost sign your name on the tyres of an A380 as it lumbers right overhead! The reality is these are used by business customers and not many corporate policies stretch to sofitel prices. For the leisure customer Sofitel is a great way to start a special holiday but reality for most is you stay in one before an early flight and you’re just after somewhere cheap and cheery before you head off to your proper holiday. Not all about you and what you want though is it – the hotels at LHR that is. Plenty of people want this price point in the market even if you don’t. I’m looking forward to the new HGI at T2 though with the same chain running so many, it’s not like they’ll compete on price. A rooftop bar overlooking the runway will be worth a visit I’m sure. Nice little mini review from Nige above. I loathe Accor so much that I would sooner take a bunk in the local hostel rather than give them any money. As for the new Crowne Plaza in today’s review, couldn’t you simply slip into the HIX breakfast area and have breakfast there? I presume they check your room number and that this will show which hotel you are staying in! I’ve always had room number checked at HIE/HIX before. Same with Hiltons when going for free brekkie from status. @Concerto better make sure you don’t visit the Qantas lounge and bar in T3 either, then, as Accor run the lounge for Qantas. I hate this “generation 4” design with no desk.. How expensive would it be for them to put a small desk there? Also, HIX advertises itself as a 4 star hotel on booking.com.. That’s quite interesting.. I think I might stay at the Premier Inn and wander across to Urban for dinner. Wonder if Urban does paid breakfast? It does, £17.95 full English, £14.95 continental, kids half price. Have you stayed there yet? It’s clean and pleasant(ish) but a bit basic. We were fighting over the two very mean pillows on the double bed. I’d definitely try one of the IHG ones next time – hotels that is not pillows. If all you want is a bed before an early morning flight (and why else would you stay at an airport hotel?) then a Premier Inn or equivalent is perfectly acceptable. I’ve stayed at that T5 Sofitel and it’s fine. But I went to the M&S shop in T5 and bought some food and a bottle of wine for 20 quid – the same in the Sofitel would have probably set me back 60. What we really need is a cheaper hotel adjacent to T5. T4 now has 4 walk-to hotels and T5 only has one. Mrs K and I like to start a holiday in the most relaxing way possible. Often that means staying the night before in a hotel by the airport and thus a bit of luxury) good ambience is nice. Often we’ll turn up early-ish and have a meal at the hotel or locally. Whilst slating Nigel above for hotel snobbery, I have to say that I draw the line at buses – but that’s very much a personal issue!